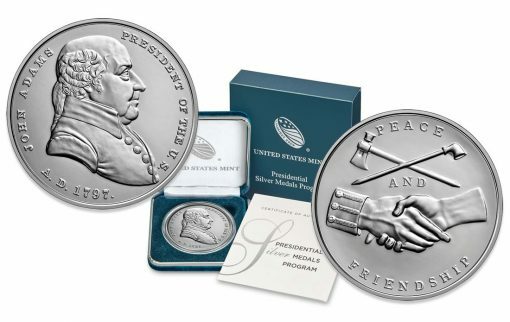 The United States Mint released today a pair of Presidential medals, the first in a new silver series, featuring George Washington and John Adams. Sizes of the medals will look familiar as they are struck on the same planchets that are used for American Silver Eagles, with each featuring a composition in 1 ounce of .999 fine silver. Unlike the Silver Eagles, the medals have a plain edge. *The medals may be produced across multiple production facilities and will not have a mint mark. 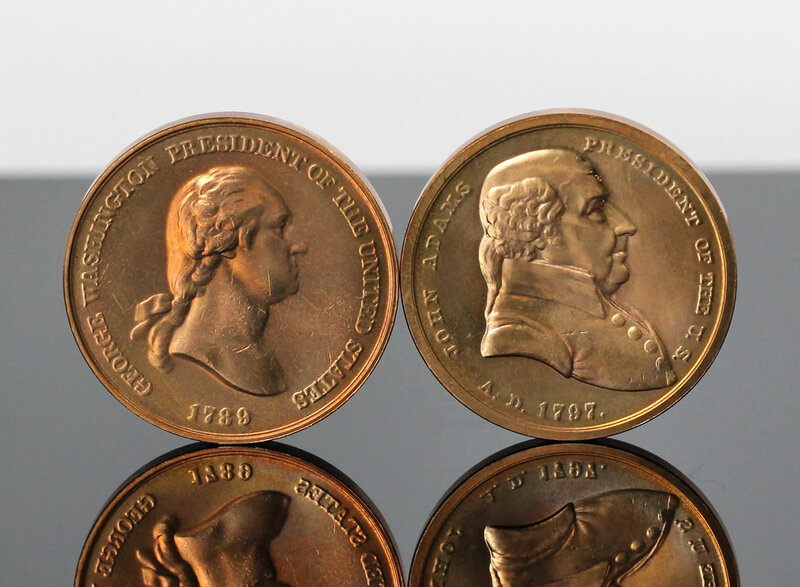 Portraits of the nation’s first two presidents highlight both medal obverses. The one for the George Washington Presidential Silver Medal shows Washington’s effigy along with inscriptions "GEORGE WASHINGTON," "PRESIDENT OF THE UNITED STATES" and "1789." Obverses of the John Adams Presidential Silver Medal carries Adams’ portrait along with surrounding inscriptions of "JOHN ADAMS," "PRESIDENT OF THE UNITED STATES" and "A.D. 1797." Reverses are the same on each medal. 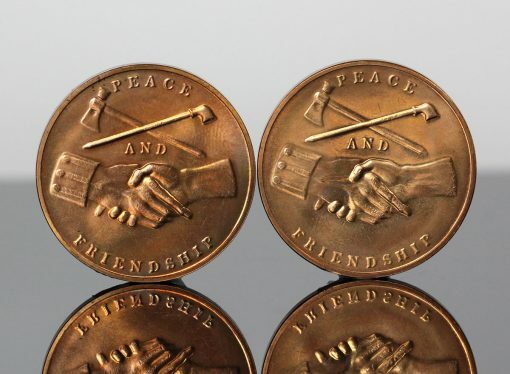 They include the inscription "PEACE AND FRIENDSHIP," symbolized by two hands clasped in a token of amity and a peace pipe and the tomahawk crossed over each other. On the cuff of the left wrist are three stripes with buttons, with each button carrying the American eagle. Some collectors will recognize the artwork on both medals. The U.S. Mint has produced bronze medals with these same designs for many years. The U.S. Mint also strikes Presidential bronze medals. This CoinNews photo shows the obverses of George Washington and John Adams Presidential Bronze Medals. 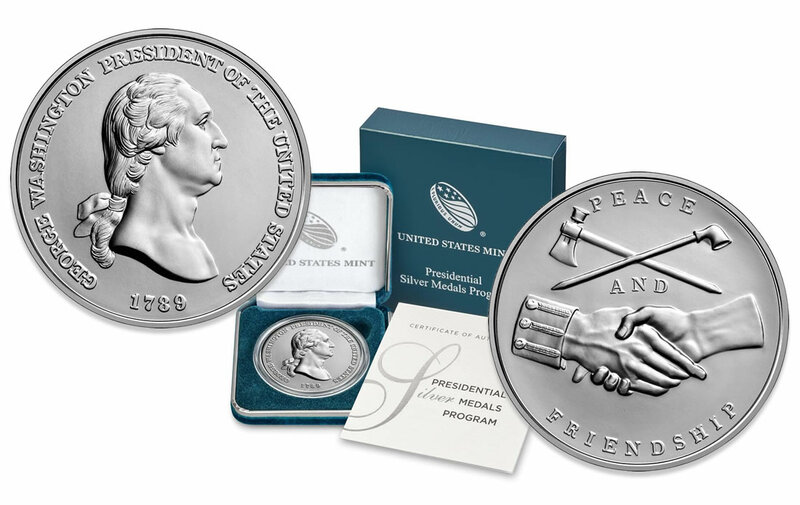 The Presidential Silver Medals series complements and shares designs of the Presidential medals in bronze, and Presidential Medals began as the Peace Medals series, the U.S. Mint notes. Presidents gave medals as a sign of peace with Native American tribes. "The current Presidential Medals series features peace medal designs until the Ulysses S. Grant medal, with some exceptions," the Mint describes. "The presidential medal designs differ from the original peace medal designs for George Washington, John Adams, William Henry Harrison, James Buchanan, and Abraham Lincoln." Pricing for Presidential Silver Medals is $39.95 apiece. As a comparison, George Washington Presidential Bronze Medals are currently $39.95 for the 3-inch edition and $6.95 for the 1 5⁄16 version. Orders are accepted by calling 1-800-USA-MINT (872-6468) or by visiting the U.S. Mint’s online catalog for Presidential Medals. The medals have no sales deadline or mintage limits. Each medal is encapsulated, and arrives packaged in a clamshell case with a standardized Certificate of Authenticity. The series picks up again in 2019 and continues beyond until completed. The U.S. Mint will release them at a quarterly rate for a total of four per year. Update (Aug. 17 at 9:54 a.m. ET): First-day sales of the George Washington medal hit 5,466 while those for the John Adams medal reached 4,506. Many assume there will be 45 of these silver Presidential medals issued during the new program, but long-time collectors of the bronze U.S. Mint Presidential medals realize there could be many more. Starting with Nixon, every President elected to a second term also had a second Presidential medal issued (Nixon, Reagan, Clinton, Bush, Obama). When will the U.S. Mint state the number of medals expected to fulfill this new silver medal program?